Before you decide to buy a brand new basketball hoop, you should be aware of some of the different basketball backboard materials that are used. Picking the right backboard is by far the most important factor to consider. Two of the most common ones are polycarbonate and acrylic basketball backboards. Both are quite common and popular outdoor basketball backboards that are featured out on the market. However, which is better is what a lot consumers want to know. Well lets delve into the differences between polycarbonate and acrylic basketball backboards, and which ones are worth buying. Acrylic is the most common used plastic you'll find on the market when it comes to outdoor basketball backboards. Acrylic resembles glass, and can do a lot of what glass can do. Like glass it is clear, and is often used in replace of glass. For example, your bathroom showers, or widows are probably made from acrylic. Acrylic is very strong and doesn't just shader the way glass does. That's one of the advantages of buying acrylic basketball backboards. However, acrylic is much lighter than glass. That's not a good thing for backboards. Lighter means less bounce. Although durability is definitely one way to judge a quality backboard, but a good bounce is another. Although acrylic will provide bounce, it just won't bounce the way a professional tempered glass backboard will. A definition of a quality acrylic backboard should be between 3/8" and 1/2" thick. Portable: $150-$700 dollars for 44-60 inch backboards. $500-$2,000 dollars for 50-72 inch backboards. Wall Mounts: Quality adjustable basketball backboards will cost over $1,000 dollars. 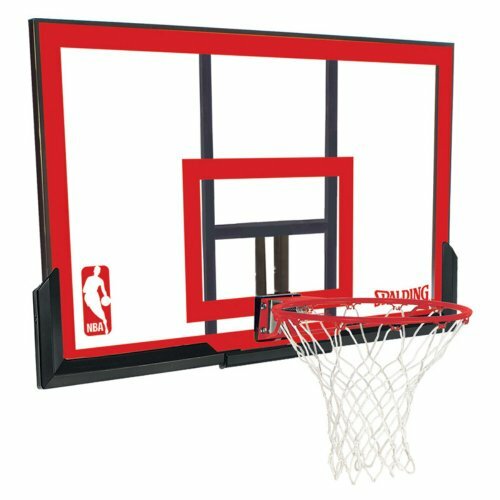 Regular wall mount basketball hoops will cost between $200-$500 dollars. In Ground: $100-$350 for in ground basketball hoops that range between 44-54 inch backboards. $800-$3,000 for in ground 60-72 inch basketball backboards. Polycarbonate basketball backboards have quickly evolved and have become much more reliable than acrylic. Acrylic and polycarbonate are very similar. They don't differ much from pricing. Polycarbonate like acrylic is a clear plastic expect it is five times stronger than acrylic. It is a much more durable backboard that won't provide cracking, or breakage. Polycarbonate basketball hoops are much better to play on for durability. A lot of outdoor parks use polycarbonate to prevent any vandalism, or damage. Polycarbonate provides the same bounce as acrylic. One of the disadvantages of polycarbonate, compared to acrylic, is that more basketball backboards are made with acrylic. For example, if you're looking to buy a good wall mounted basketball hoop, polycarbonate might not be the way to go. Adjustable ones are much better and more expensive. 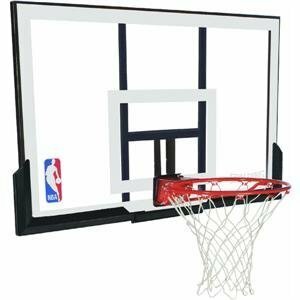 There are not many, if any adjustable basketball wall mount hoops available in polycarbonate. Polycarbonate hoops are much safer to play on. Actual performance outside durability and strength doesn't differ much. Portable: $250-$500 dollars for portable hoops between 44-54 inches. Another disadvantage is that you won't find professional sized 72 inch portable backboard hoops. Wall Mounts: Wall mounts are pretty cheap, and can go anywhere between $100-$500 for 44-54 inch backboards. Adjustable ones aren't available online though. Overall they're cheaper than acrylic. In Ground: $150-$350 for 44-54 inch in ground hoops. $1,000 - $2,500 dollars for 60-72 inch in ground basketball backboards. As you can see prices can pretty much vary between the two. You can find some rather cheap, or very expensive polycarbonate and acrylic basketball hoops. A lot of it also depends on the type of hoop, and the dimensions of the backboard. Of course breakaway rims, and things like that might account into pricing as well. Portable hoops are the least reliable. However, more versatility is offered for acrylic portable hoops compared to polycarbonate. 72 inches is what the professionals play on. Also, wall mount acrylic hoops are better as well. Adjustable wall mount, and 72 inch wall mount backboard frames aren't available for polycarbonate. So those who are looking for wall mount hoops, or portable basketball hoops might find more of what they need with acrylic. However, overall polycarbonate is much more reliable, stronger, and sturdier than acrylic. Prices overall don't differ between the two. If you're considering putting up a good in ground basketball hoop, then without a doubt go with polycarbonate instead. Especially if you have kids playing on this hoop, and you want to prevent unfortunate accidents.